It’s All About Color... In the Bathroom! 2019 is the year of making an artistic statement in the home, and let’s not forget about your bathroom. Bathrooms are a fun place to spark your creativity and to play with color and texture. Serving as not only a functional room but as a place of relaxation and beauty, the bathroom can become a work of art in and of itself. Homeowner, Denise Boiko, recently renovated her bathroom (seen below) and used a GlassEco surface on her vanity as the bathroom’s main focal point. ElleDecor states, “2019 is all about finding balance with appropriate doses of color. Knobs, light fixtures, and decor accents are smart ways to incorporate colors like emeralds, sapphires, and aquamarines.” Denise did just that as she created her vanity surface. With her color palette in mind, she chose various shades of recycled aqua colored glass for her GlassEco surface and further brought out the color through her choice of knobs, mirror, and towels. GlassEco created recycled glass countertops for a beautiful outdoor kitchen on Isle of Palms (seen below), and color played a key role in the design. It’s easy to see how this look could also transform a bathroom into a conversation piece. Wood is represented through growth, strength, and flexibility. 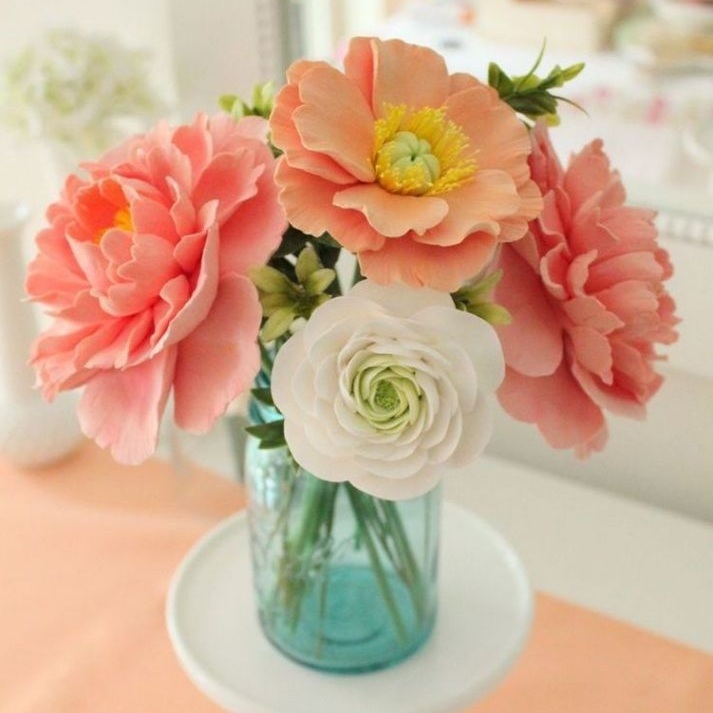 For example, you can display fresh flowers atop a beautiful wooden vanity. Fire increases leadership skills and enthusiasm. Think of candles, reds, pinks, and purples. Earth is grounding, balanced and stable. Incorporate rectangle and square shaped objects, browns, greens and even sand. Metal affects mental clarity and focus and is represented through organization and focus. Metals can be brought in through hardware (on the vanity, sink and bath) and with whites, grays and silver. Water balances and brings about inspiration and wisdom. Water effects play well with deep, dark tones and be even more dramatic when mirrors are incorporated. Using this list to choose accents, the color palette and objects come together to create an artistic statement the bathroom begs to offer. Need help to get started? Think Coral! Pantone Color Institute chooses a color each December that will set the tone for the year ahead. This year’s color, Living Coral, “is a warm peachy-orange with a life-affirming golden undertone. The color evokes vitality and buoyancy.” From the runway to art galleries, Coral is the must-have color. GlassEco has glass to complement this hopeful and optimistic tone. Starting with your surface design and color palette in hand, create a Living Coral masterpiece in your bathroom!